The re-building and enlargement of St. Wulfram's church after a major fire in 1222 was a process carried out over two and a half centuries or so, say from 1250 to 1500. This period covers most of the important styles of the Gothic era and so makes a tour of this church particularly instructive. Moreover, many of the windows offer examples of the various styles of tracery which are among the finest in the country. 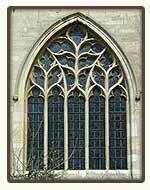 The principal windows are numbered 1 to 21 anti-clockwise around the church as shown.